You saw what my kiddos have been busy with in the Plant Thematic Unit, but I’ve been testing my green thumb too! 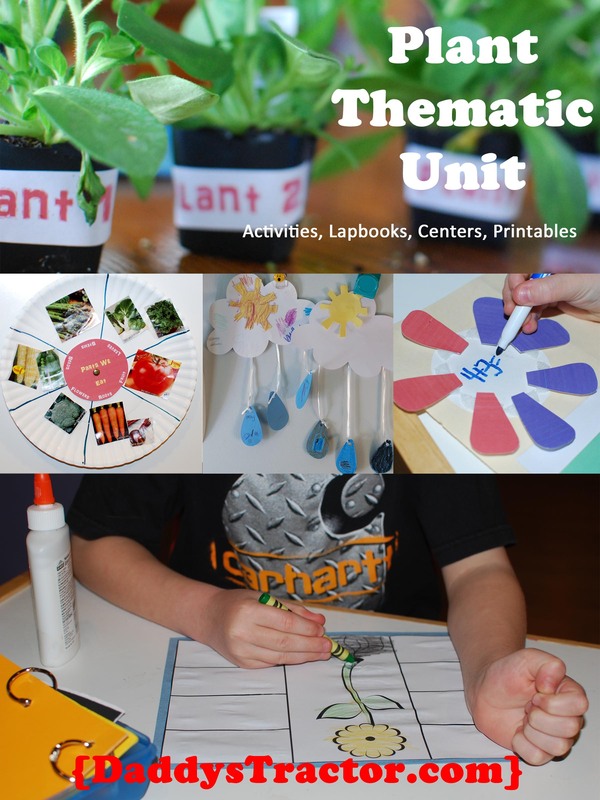 I’m a big believer in using thematic units because they work for kids across a wide range of abilities, including siblings in a homeschool family. So I’m sharing some of the projects I’ve been working on as classroom enrichment, extensions for older siblings, or fun projects for mom! 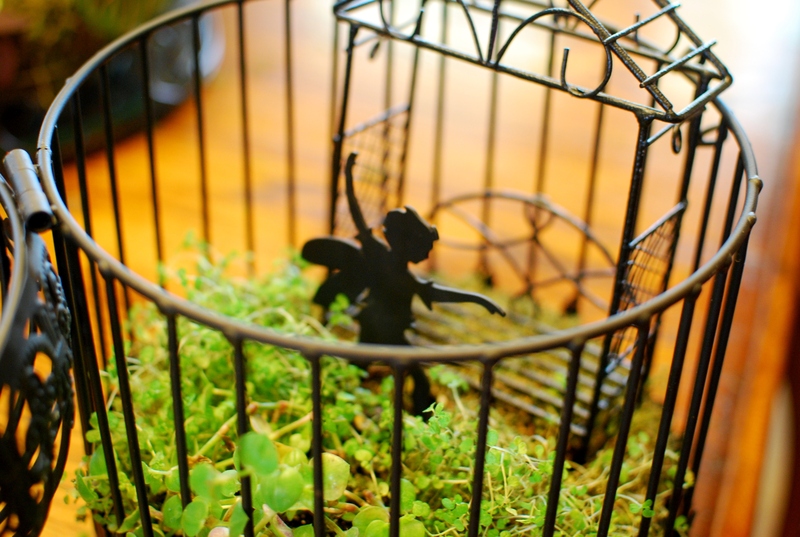 You could have lots of fun building your own fairy items (or shopping on Amazon! ), you could write a story, or you could follow Anna’s lead and dance around the house like a fairy for a week. Brett helped me with this “art” project. The box is a shadow frame (Hobby Lobby) we turned upside down so the glass is on the bottom. 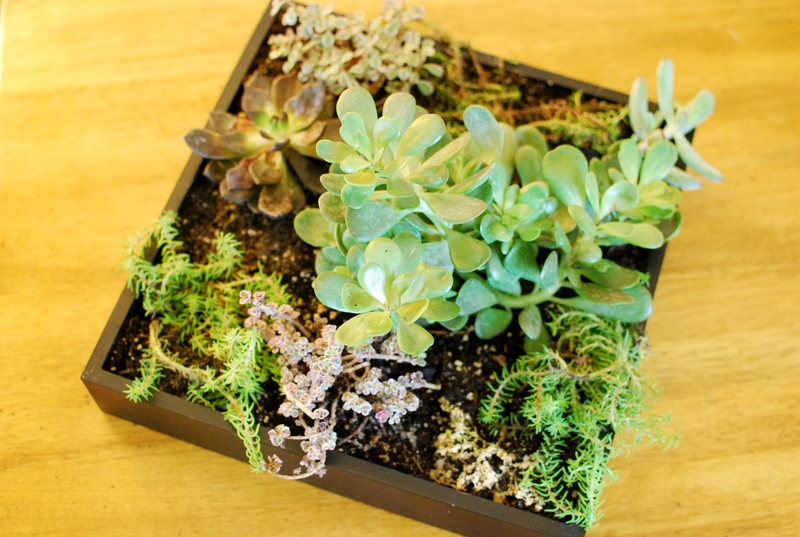 Using 4″ square pots Brett and I could arrange and rearrange the succulents to our heart’s content. I wanted to hang this on the wall, like I’d seen all over the internet. BUT… it is heavy! So I think I’ll use it as table décor. 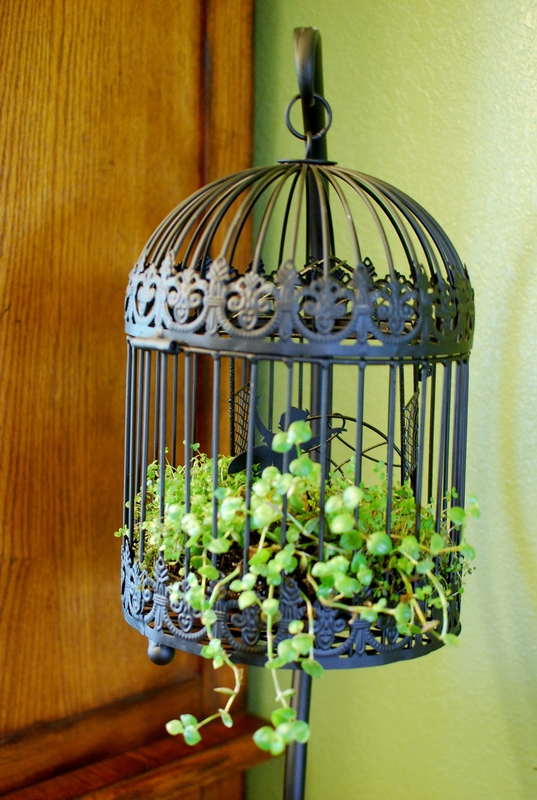 This planter is a cheapie basket (NOT from Hobby Lobby, but I’m sure you can find one there.) 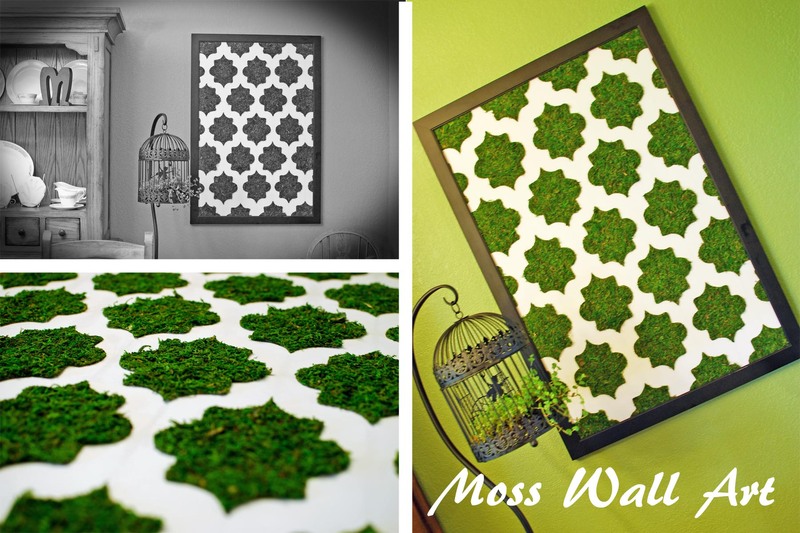 and moss paper (Hobby Lobby! Look by the floral foam.) wrapped around with string. You’ll need to choose a basket with a large enough weave to fit a large darning needle through the spaces. Hot glue helps too! The basket came with a plastic liner but you could probably line the basket with plastic yourself too. Then you just need soil and plants! This is more of that moss paper (heart! 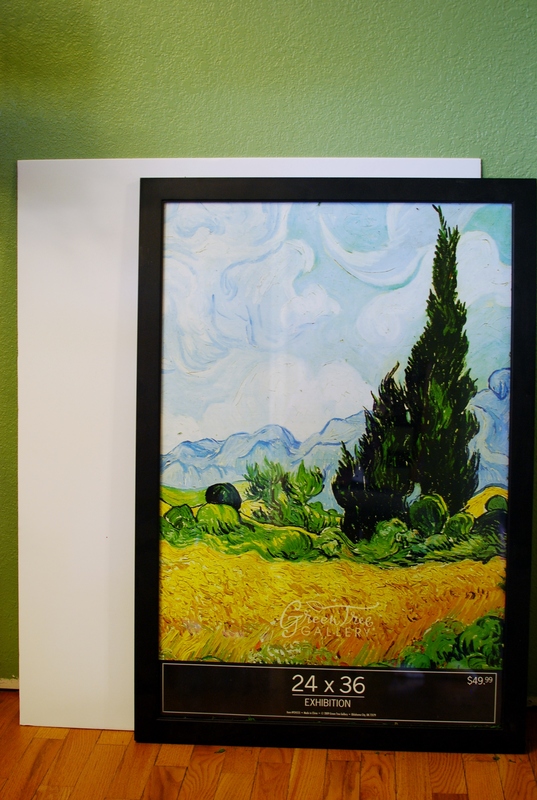 ), a simple frame and piece of foam board. All from Hobby Lobby. They should be paying me for this post. This requires math, which makes it the perfect project for a student who thinks they are making art. 😉 First, design a stencil. 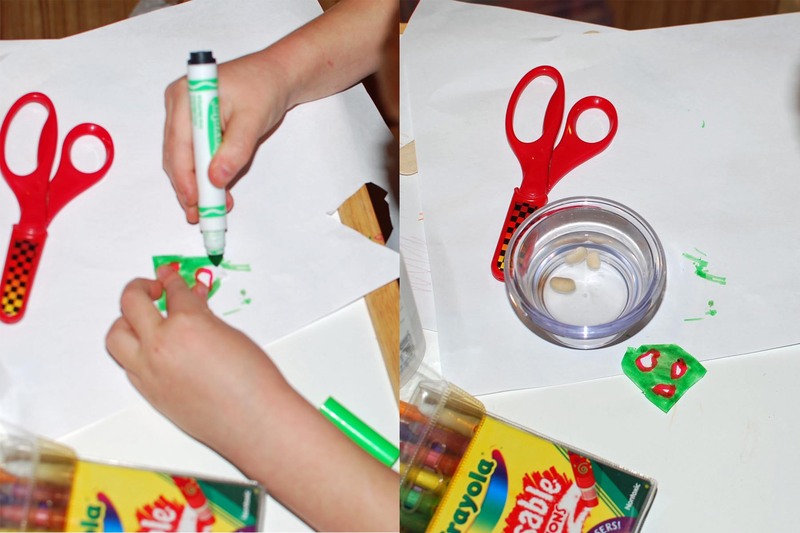 Nothing too complicated because you will trace, cut and glue this many times! 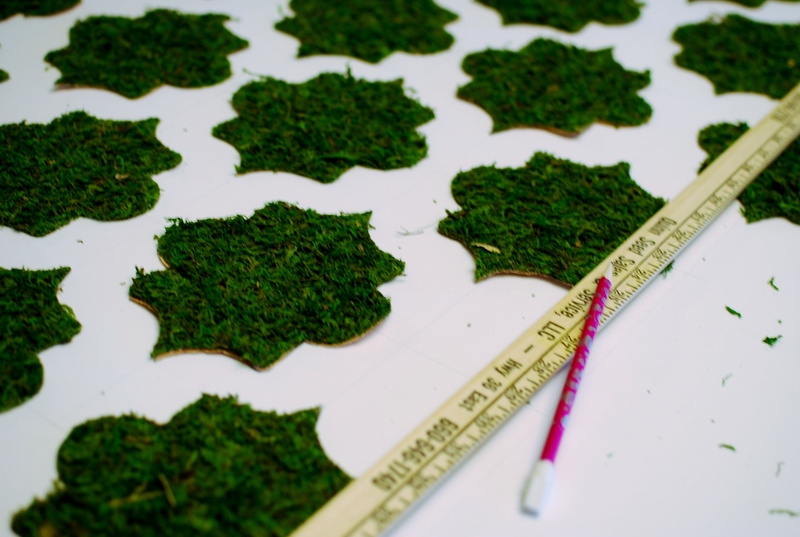 Trace the stencil onto the back of the moss paper and cut. Over and over. I recommend watching a movie. Then create a grid on your foam board. 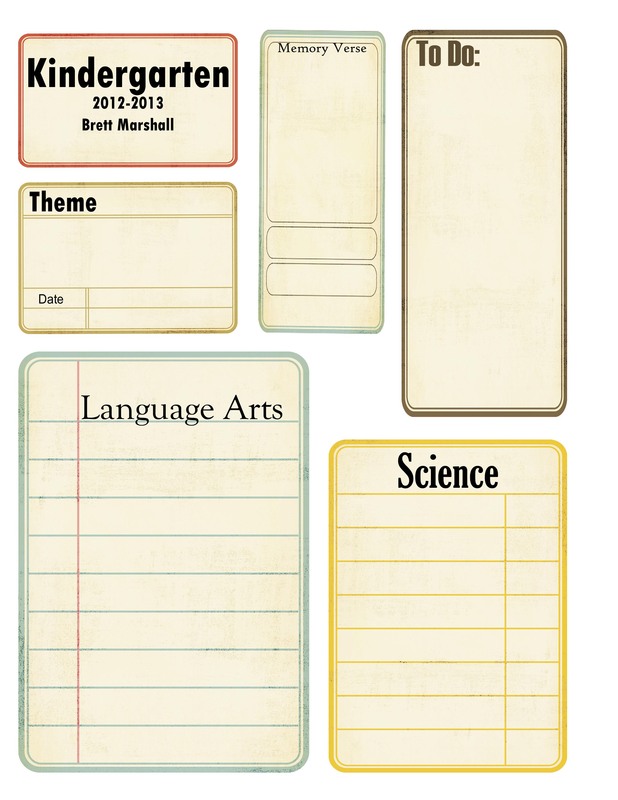 Get a rough idea of how far apart you want to space them and lightly mark the middle. Measure the distance between the center of two stencils so you’ll know how far apart to make your lines. Do the same thing with the offset lines. You’ll have two sets of grid marks, because of the offset lines. Do check it to make sure the math matches up with your eye. 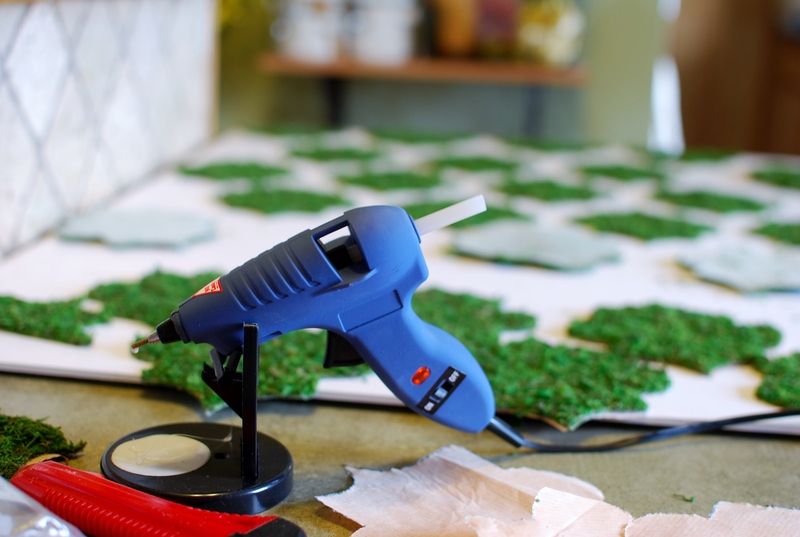 Then remove the paper backing from the moss and hot glue to the foam board. I suggest using a high temp glue gun. Trim the edges as necessary. Carefully erase the grid lines. Remove the glass from your frame if desired and put in your beautiful creation! Many of you said last month’s Insect Unit was oodles of fun, so today I’m sharing the Plant Thematic Unit we’ve been exploring . It was perfect for homeschool since we are spending lots of time in the garden anyway, but its also the fun kind of unit I would have used as a kindergarten teacher to get us through the end of the school year or for summer school! 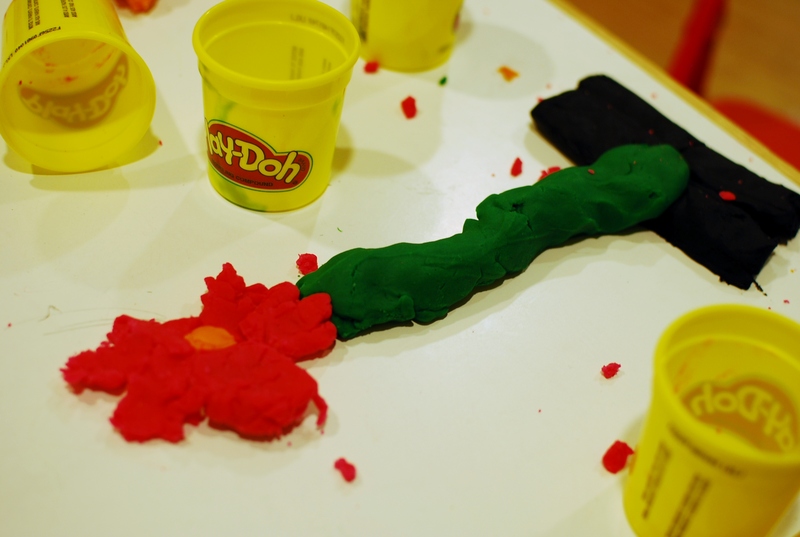 Of course we used play dough to learn plant parts! In addition to leaves, Brett also added a stigma and stamen after I took this picture, which could enrich this idea for older children, depending on how complex they made their models. 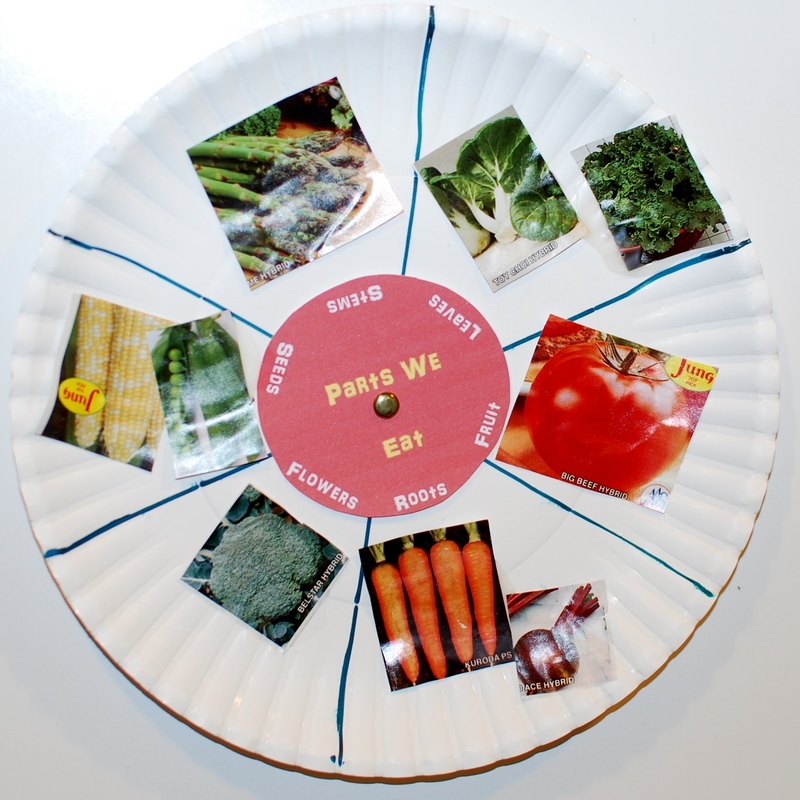 Understanding plant parts led us to a project learning about the parts of the plant we eat. I divided a paper plate into six sections. 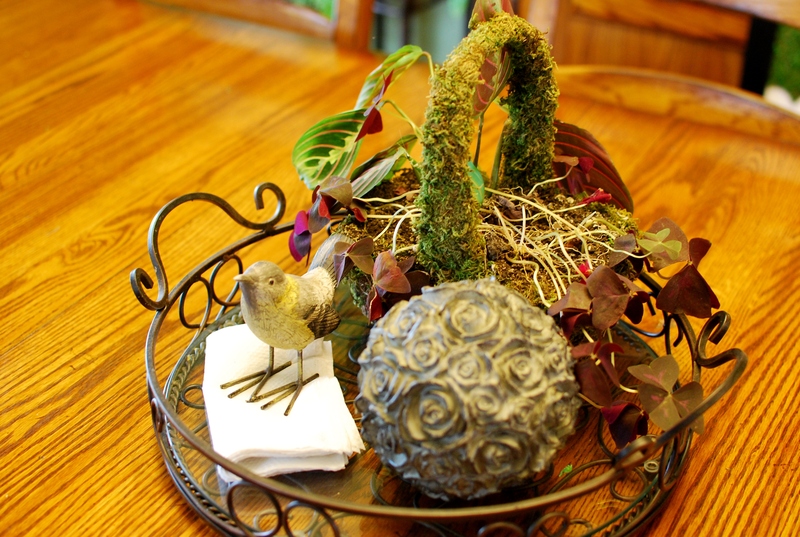 Next we cut out the center circle from Plant Parts We Eat and attached it with a brad. Then we cut pictures from garden magazines. (For free catalogs try Gurney’s, Jung’s, Burpee, or Johnny’s. They do take a few weeks to arrive. You could also print the picture of food from the Who Grew My Soup post.) The kiddos matched up the food to the plant part and glued. This became a center activity because the brad allowed the circle to spin and become a puzzle over and over! 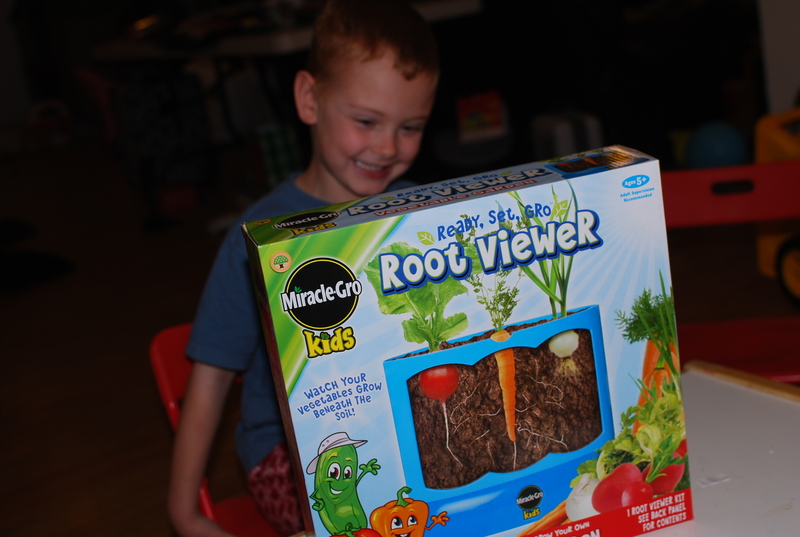 We found this root viewer at Wal-Mart, but after opening it I think you could make one of your own by filling a quart jar with potting soil, placing seeds 1/4 of an inch from the edge of the jar, and covering outside of the jar with black construction paper and a rubber band (they need dark to grow). Simple and cheaper! Since lap books are our new favorite thing I created a foldable book to review plant parts and what plants need. Print this Plants Have Plants Need chart and glue it onto construction paper if you like. 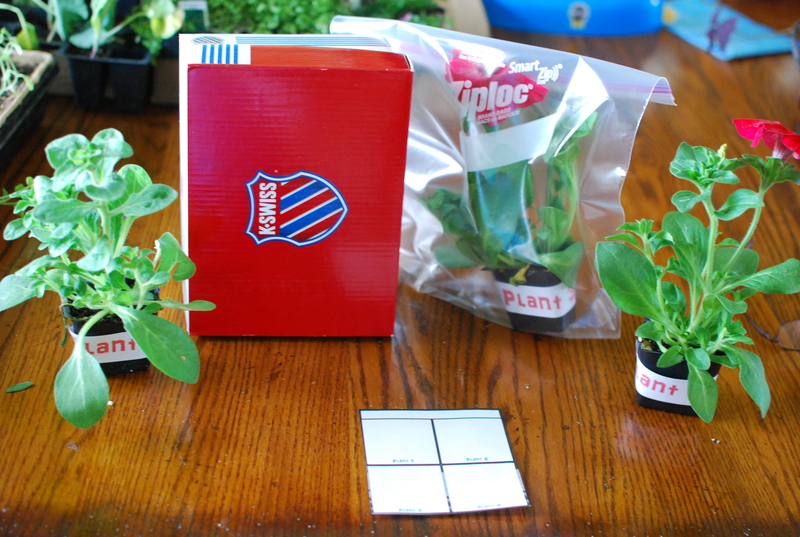 These Plants Have Plants Need labels can be cut out and glued into place on the flaps. 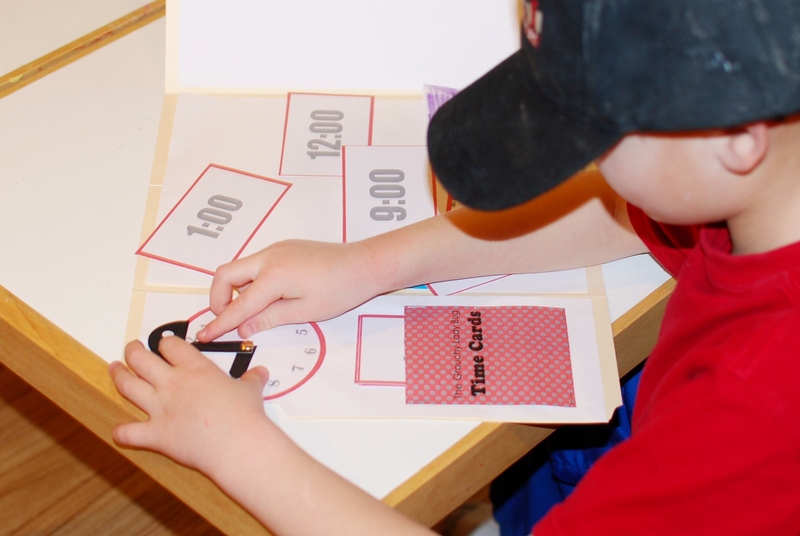 Also for the lap book (or center) we made a flower petal math game. I used an advertisement refrigerator magnets to make the circle for the center and covered it with contact paper. 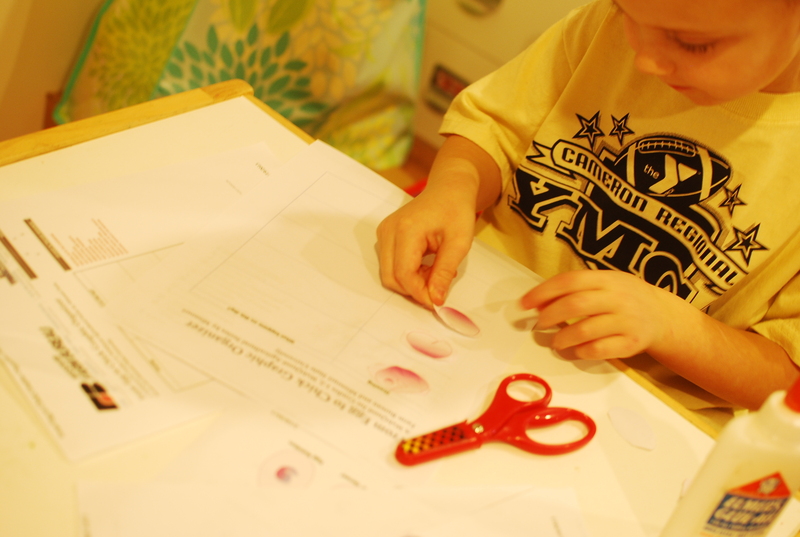 Then I cut flower petals from cardstock and added snips of magnets. Anna made patterns or used a wipe-off marker to write the number of petals I put on her flower. Brett got two colors of petals and had to write addition problems with the marker. To observe how seeds begin to grow we traced bean seeds and then allowed them to soak in water for a few hours. When we came back we could clearly see how the seeds had swelled and the outer paper-y layer was peeling back! And since I was unexpectedly promoted to Sunday School teacher during this unit, here’s a bonus activity I did for church. My poor kids had way too much “plant” that week, but it was last minute! We compared faith to a seed, planted in our hearts. Just like seeds need sunlight, air, and water our faith needs things to grow. 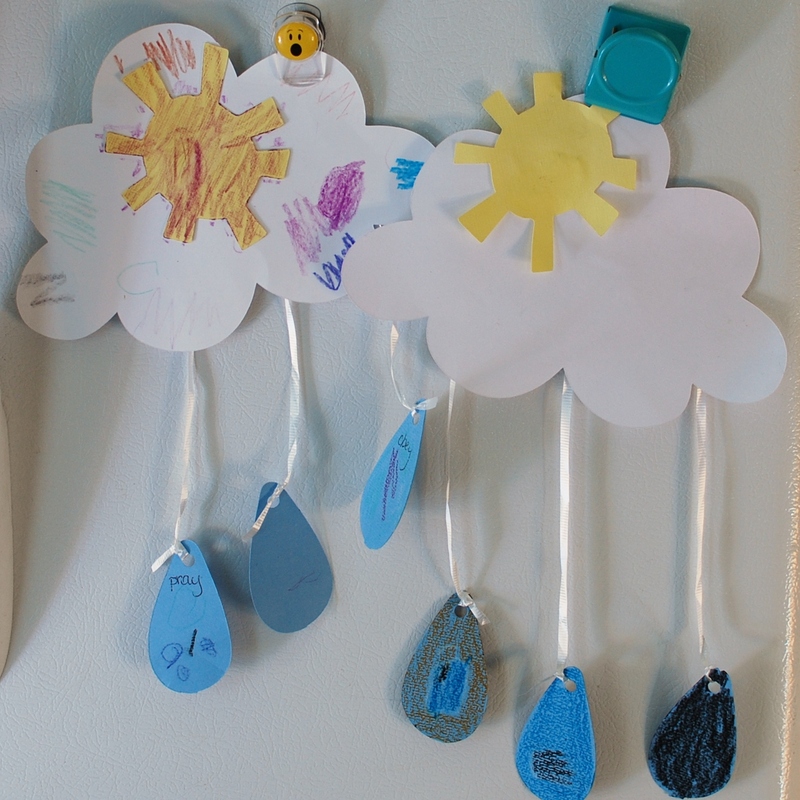 We brainstormed ideas and they drew three they like on the rain drops; things like praying, obeying parents, going to church, reading Scriptures. Or you could just make the mobile with no pics at all :-). And last but not least, no unit is complete without snacks! 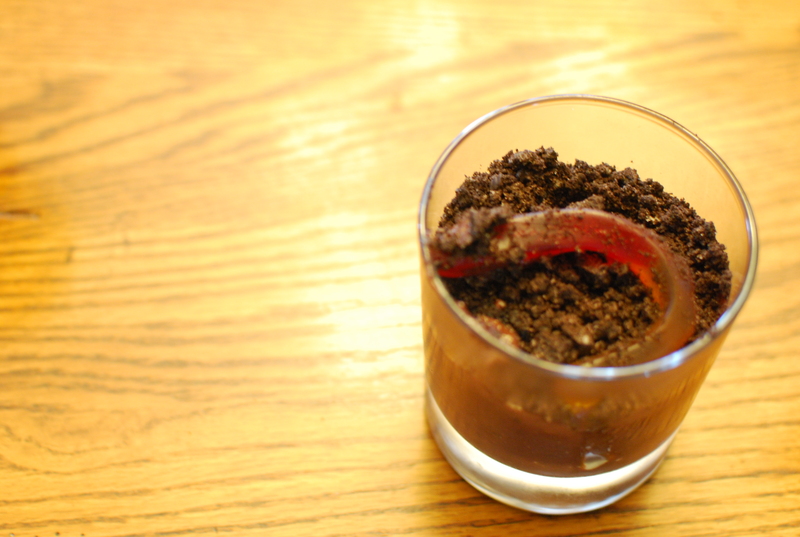 This is “dirt” pudding; chocolate pudding mixed with crushed Oreos and layered with a few gummy worms. Sooooooo educational! 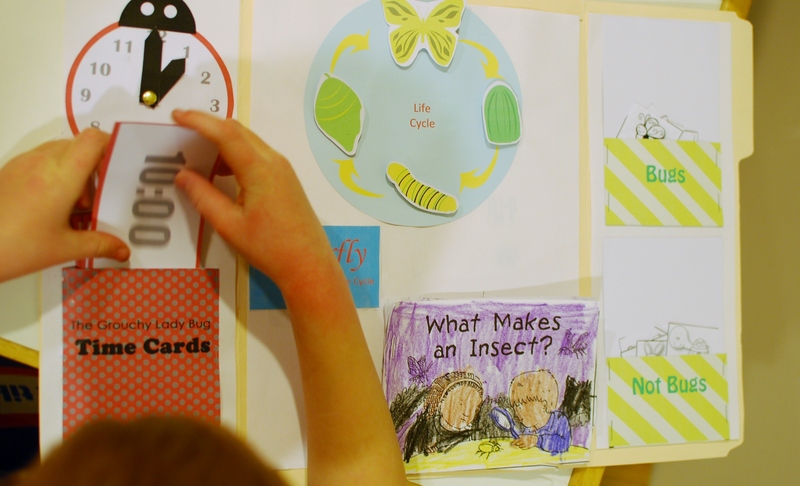 A few weeks ago I shared a lap book activity we did as part of our Insect Thematic Unit. Since the creepy crawly bugs were a big hit at our house and the activity was at least noticed online 😉 I thought I’d post the whole thing. We started by learning what makes a bug– three body parts, six legs, antenna. 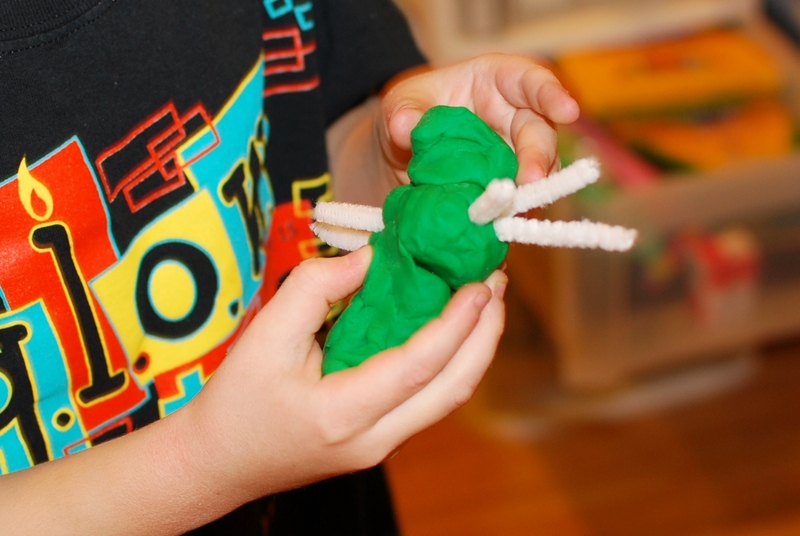 And since no theme unit in our home is complete without making something out of play dough, we went ahead and got that part over with had lots of fun making bugs! Our Insect unit was full of science, so it was nice to add some dramatic play for social studies. The kiddos acted out a butterfly life cycle, starting as a bunched-up ball to represent the egg, then crawling on the floor like caterpillars, hanging upside down and being a chrysalis, and finally emerging and being butterflies. After emerging and allowing our wings to dry, butterflies of course, must find food! So we had a drink of flower nectar with our long, straw-like tounges! And because all lessons are learned better with food, we also learned how bees, butterflies and other insects pollinate flowers. 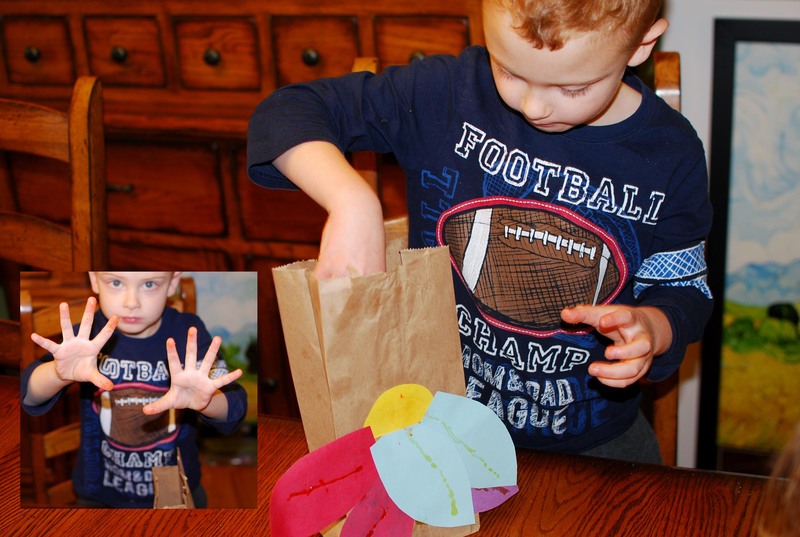 First the kids cut and glued petals to the outside of a brown paper lunch bag. Then I filled them with (a small serving of baked) Cheetos. They ate the snack and wiped their fingers on the front of the bags as if it were pollen– what’s not to love?! For art we painted a paper plate red, allowed it to dry, then cut it up the middle and attached the two pieces together with a brad. Then they both glued a head and dots to their ladybug. Naturally Brett added a face like the grouchy ladybug in the book. 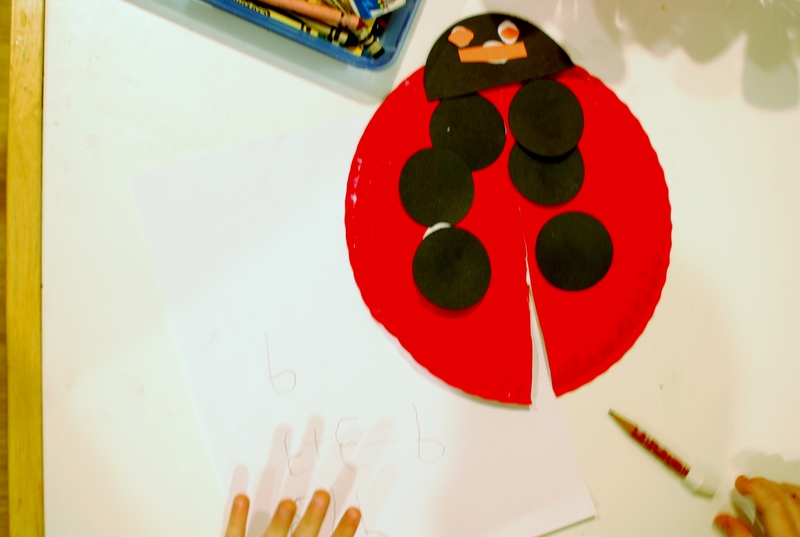 While Anna worked on her gluing technique, Brett wrote down different ways to represent the dots on his ladybug. He wrote a six first, then made an addition problem by adding the dots from each side of the body (3+3=6), then wrote a fraction showing how many of the bugs were on the left wing (3/6). We added a few more things to our lap book. 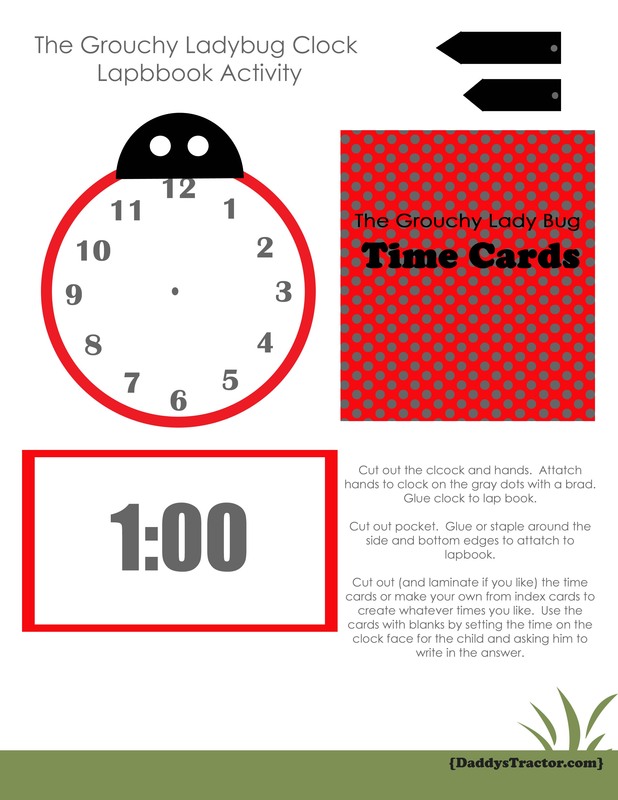 There was the Grouchy Ladybug clock activity from the first post. And then we had fun with a life cycle circle with Velcro pieces that can be put together over and over and over again! We collected pictures from magazines and printed some from online and then sorted insects from non-insects. Watch the pictures you choose, cutesy ladybugs don’t always have six legs or three body parts! 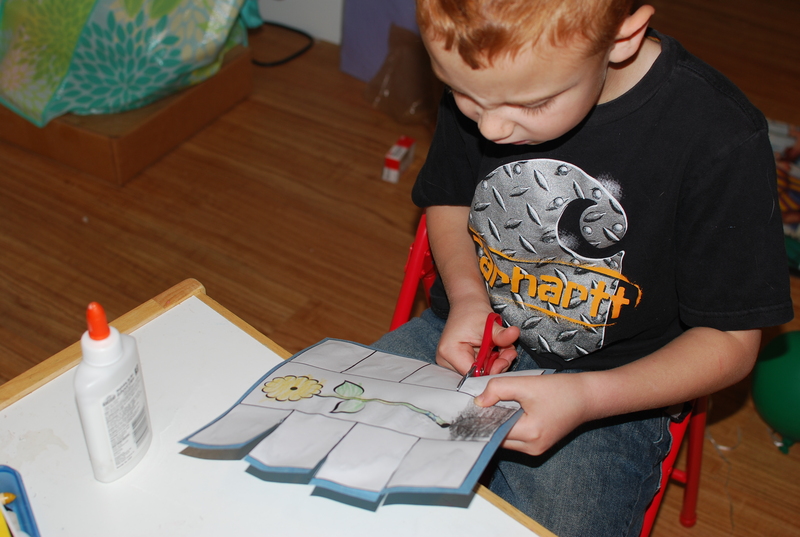 We taped these Bug Sorting pockets into our lap book and used them for storing our pieces. Brett was interested (for a few minutes anyway) in watching YouTube videos of bees “dance” to show the other bees where the flowers are. 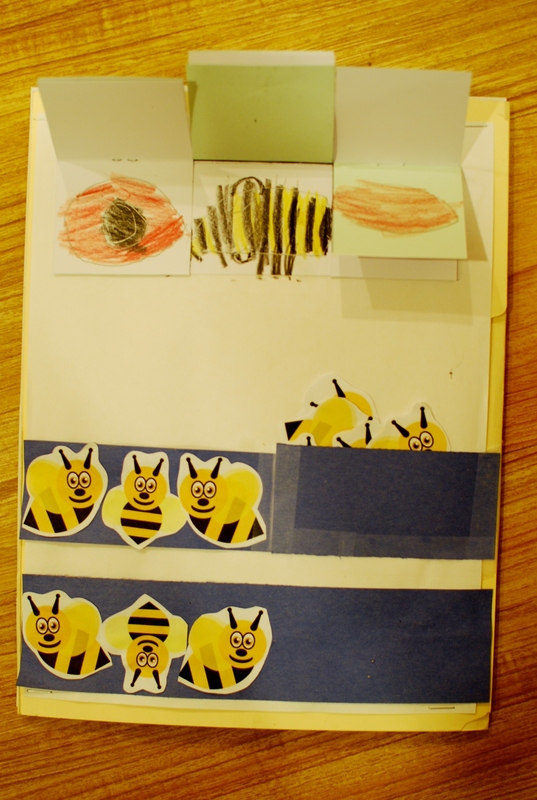 He had more fun gluing his own dancing bees into patterns on the back of his lap book. And the Body Part activity on the top half of the folder was a funny way to teach “head,” “thorax,” and “abdomen.” Making sure each body part touched the edges of the paper we took turns drawing insects. Then we lifted the flaps to create funny, mix-matched bugs! Anna wasn’t much help drawing, but she laughed uproariously each time we made a silly creature! Naturally, books are the most important part of any unit! Our library had lots of non-fiction books about butterflies, bees, ladybugs etc., for all reading levels and but our favorites were The Very Hungry Caterpillar and The Grouchy Ladybug, both by Eric Carle and several Magic School Bus books. Oh! Try Nexflixing Sid the Science Kid Bug Club too. Enjoy! If I ask you what bugs eat you might say “leaves!” In which case you would be partly right. Many bugs eat leaves; tree leaves, soybean leaves, corn plant leaves. These types of bugs can be a problem at times. There are other bugs, however, that can be a farmer’s best friend. One of these is the ladybug, which is why we had to include “The Grouchy Ladybug” by Eric Carle in our recent insect lessons! 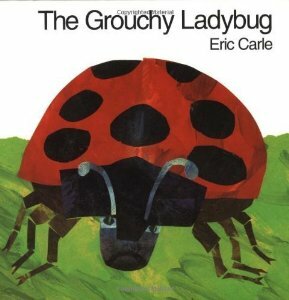 Eric Carle dedicates the book with an explanation of how ladybugs eat aphids, a rather destructive little critter. 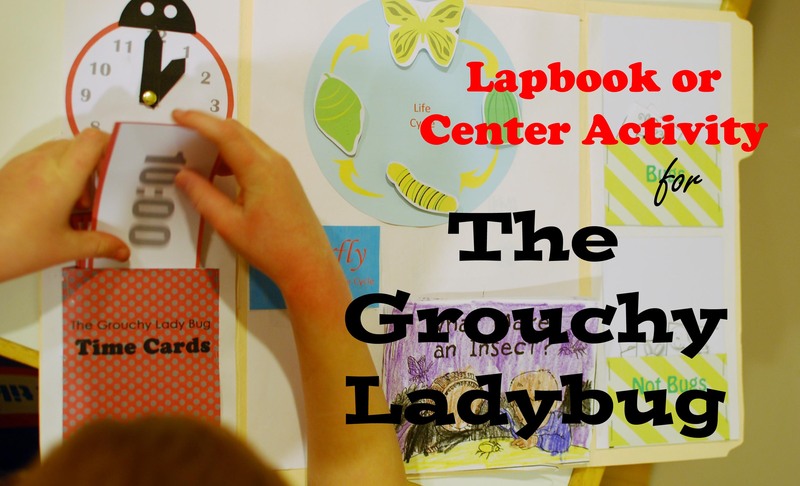 So in honor of ladybugs, here is a free Grouchy Ladybug Insect Activity that works great as a center in your classroom or in a lapbook like we did for homeschool. You know that great feeling when you stumble on something great completely by accident? I have it today! We were at the library looking for books for school, which means I’m scribbling down reference numbers and chasing children’s books from all their misplaced places, when the title of this book caught my eye. Being “Daddy’s Tractor” of course, we had to check this one out. And we’ll probably renew it too! 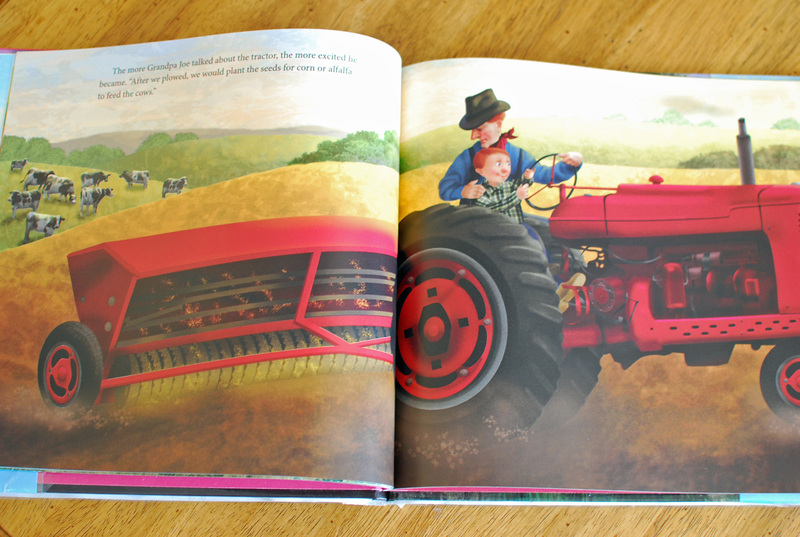 Its a whimsical book with bright illustrations and a bit of nostalgia for the by-gone era of small family farms. Grandpa takes his grandson out to the old homestead, now fallen into decay. There they find a forgotten (red!) Farmall tractor growing up with weeds. Please note that Farmall is a predecessor to Case IH. And if you don’t know what Case IH is, kindly refer to the photos in the blog title. And for all of you cheering for green and yellow, just allow me this moment. It is hard for all of us in ag to find truly good literature, but do you know how hard it is to find books with red tractors?! 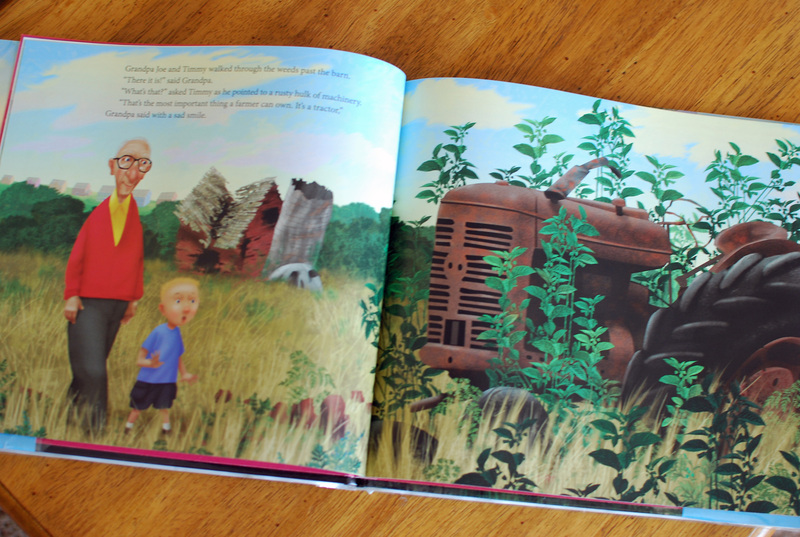 But back to the actual point… Grandpa tells his grandson all about the work the tractor used to do on the farm when he was a boy, making this book a fantastic addition to our History of Agriculture Theme Unit. The author/illustrator is not a farmer (or even remotely connected with ag in any way) and it was not written to be a scientifically, historically, or otherwise perfectly accurate portrait of farm life, but I thought Michael Garland did a nice job and avoided any of the usual mistakes of drawing all roosters instead of hens etc.. And the story of how this book came to be, featured on the last page, is probably my favorite part of all. So now you can be as excited as I am :-). I don’t know why I didn’t think of it sooner, but Monday morning I realized we needed to started getting ready for our baby chicks, and hey! why not learn about chicks for school too?! So that morning I scrambled about for a few minutes (thanks Google and Pinterest!) and came up with this baby chick theme unit! The best resource I found was this one from Missouri Farm Bureau. 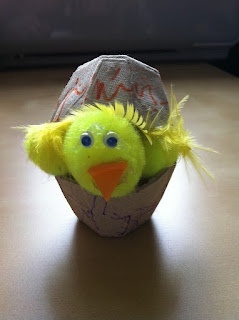 It is an online Egg to Chick Web Quest which shows pictures of chicks developing in the egg! It also had a chart to fill out, which Brett loved doing since we printed pics from one of their links instead of drawing. 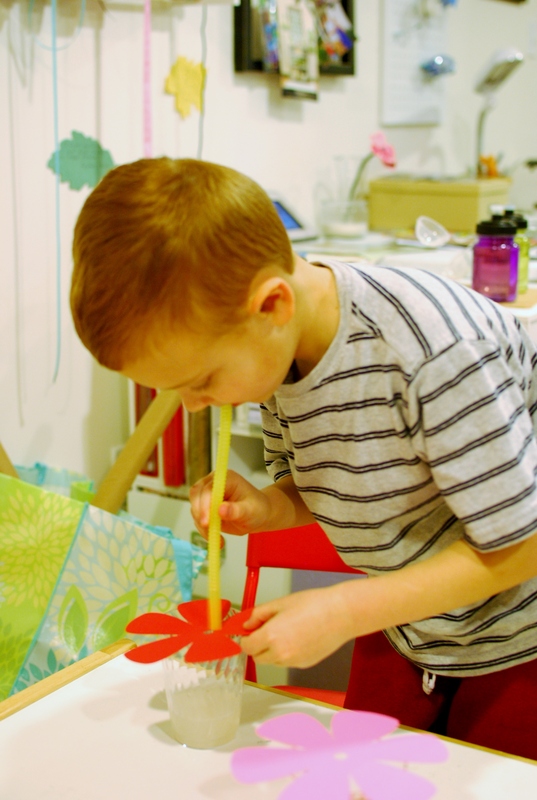 He loves glue, drawing– not so much. 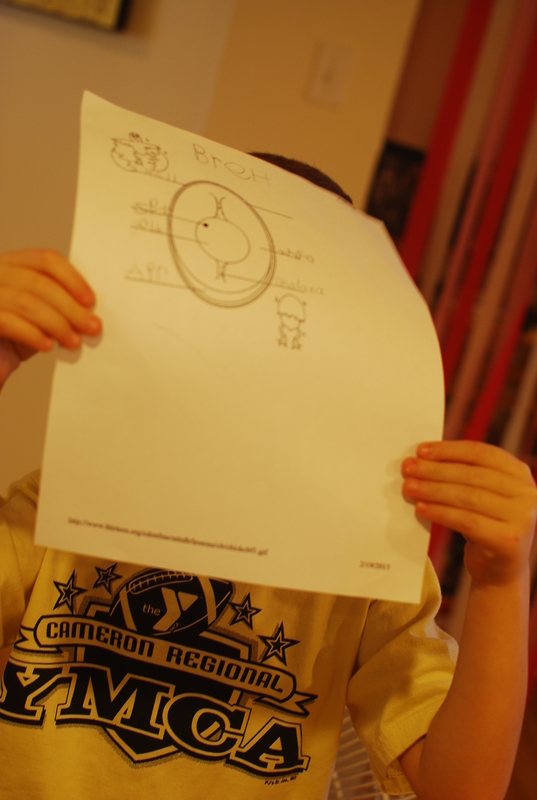 The Web Quest also provided an egg to print and label, which Brett did with a bit of help. 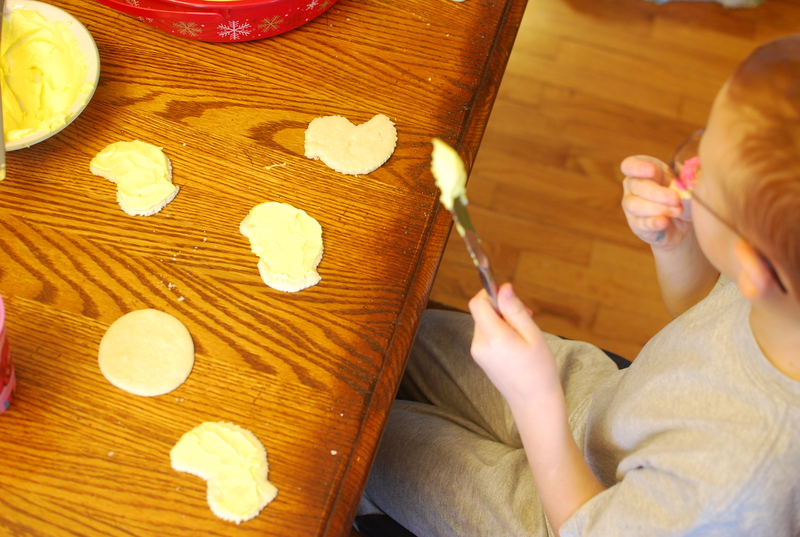 We also made chick cookies. We discussed “habitat” and what a baby chick needed to survive. 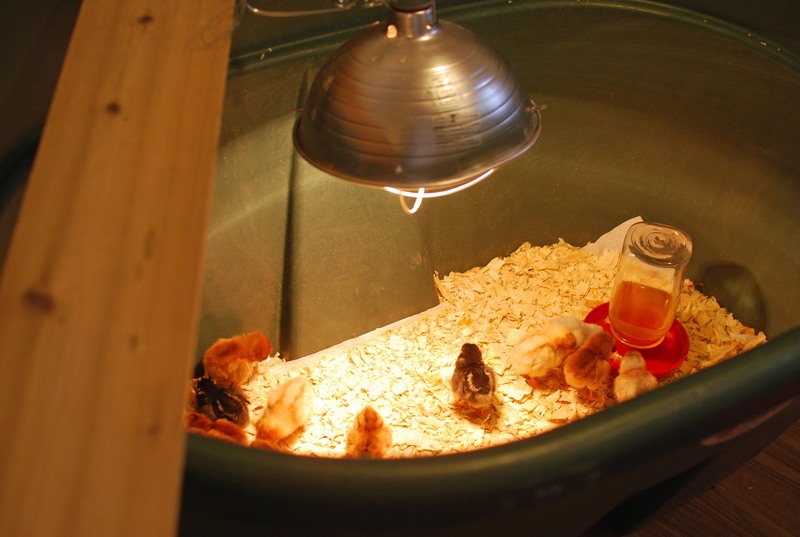 We set up a real brooder, but you could easily make a “brooder” in a shoebox! I found this pic on Pinterest with no valid link, so if it belongs to you let me know and I’ll give credit where credit is due :-). We haven’t made ours yet; hopefully we’ll get it done today! 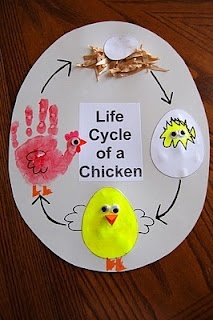 This baby chick craft from Rockabye Butterfly also looks like fun, but alas, Brett isn’t into art and doesn’t want to make crafts. But I’ll post it cause I really want to make one! We also wrote in our journal, checked out chick books from the library, colored a Little Red Hen page, and welcomed real baby chicks! So overall the thrown together baby chick theme unit turned out to be one of Brett’s favorites. Go figure, right?! How to Teach using Thematic Units OR How to Teach a Strong Willed Child! Yes, we farm around here, but we also homeschool. And since I’ve had a few requests to explain how I teach using thematic units, I’m going to continue the current Organizational theme and show you. First, THE BINDER! I have 5 tabs inside, each labeling an important aspect of my daily life. My first tab is “Calendar.” This, of course, lists birthdays, appointments, monthly goals, etc., but I also write the theme for the week on each Monday, which helps me see when we should be learning about spring or Dr. Seuss’s birthday. The key (for me) here is the more stuff is one place, the more I use THE BINDER, so add a babysitter phone number list, shopping list, whatever *you* need. 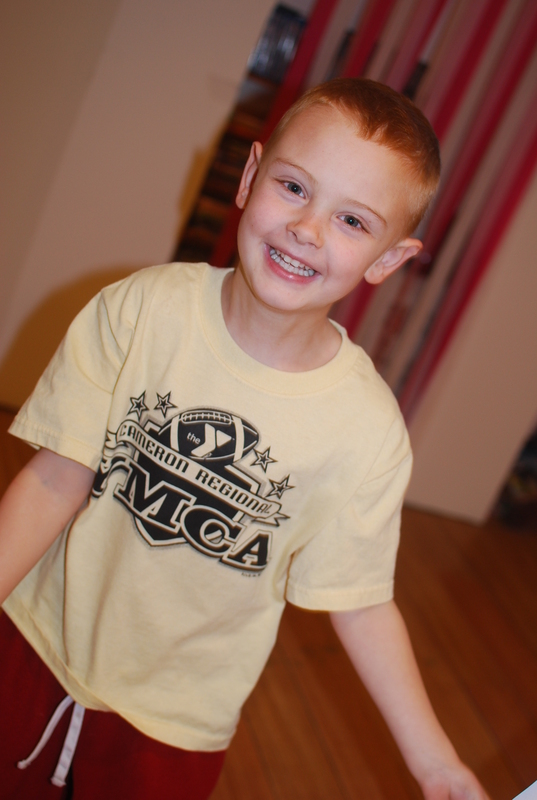 My next tab is “Brett” for organizing his homeschool curriculum, and this is where the thematic unit magic happens :-). I made these cute pages with Photoshop elements and a digital scrapbook kit. You can use mine or create your own using any simple word processing program. As you can see, I list all the areas I want to cover. 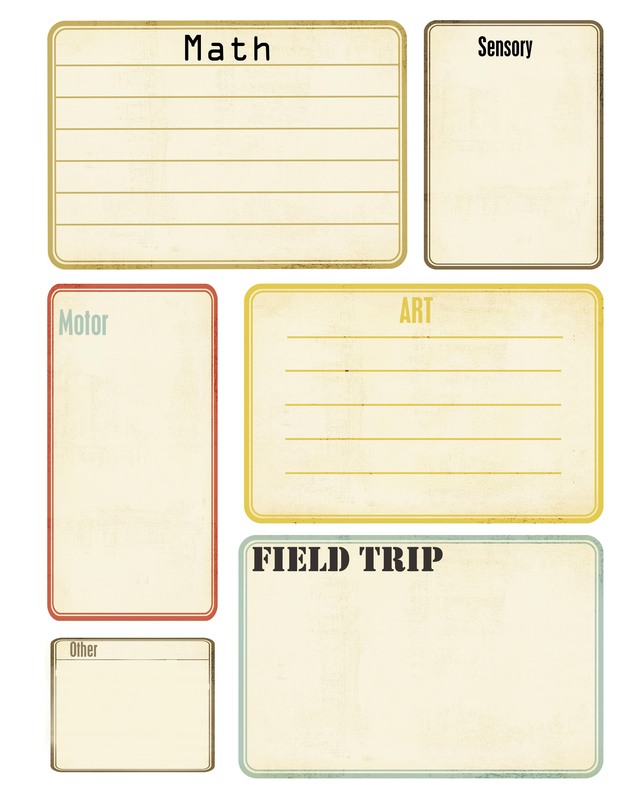 So after I choose the theme I just work on filling in the boxes with activities. 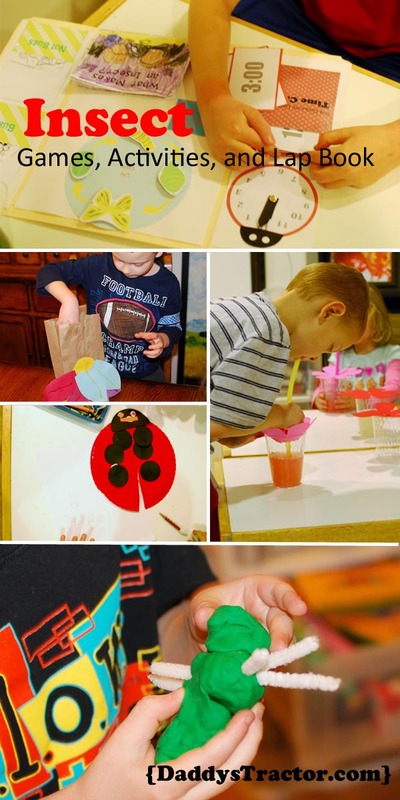 Pinterest is a great resource– I have a Kindergarten theme board and I follow several others who do as well. I use www.everthingpreschool.com a lot and just make the activities harder when necessary. I Google themes, I check out library books, I use the same standard ideas and change them just a little to go with the theme. For example, each week we journal something we learned about ______ (construction, ag history, pumpkins etc.) 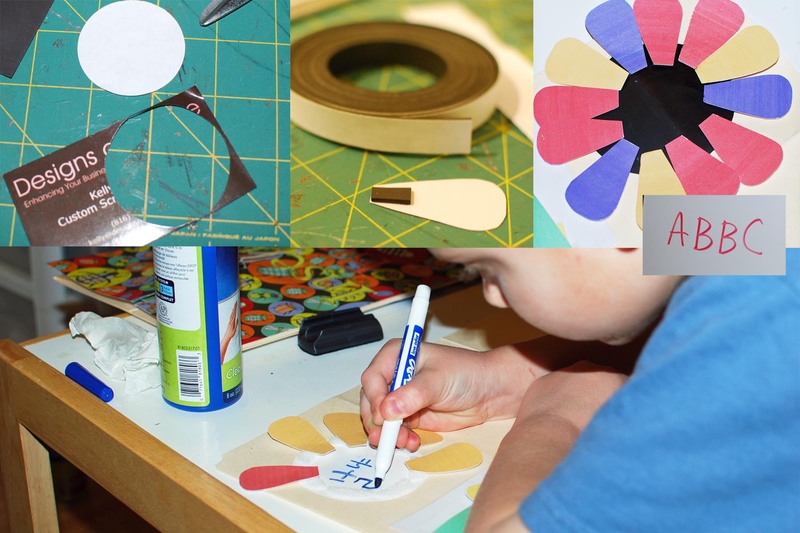 We often make a graph, use playdough to create something theme-related, do an image search to look at pictures, write a story, sort materials, diagram and label, design an object using our collection of toilet paper rolls, boxes, craft sticks, pipe cleaners and whatever. These kinds of activities save me a lot of time but still encourage learning through themes. And here is the great part. I subtitled my post How to Teach a Strong Willed Child because once these activities are filled in and I have completed the “to do” box I can let Brett make his own decisions about what we learn! A little bit of control goes a long way with the child who must always be right and he’s still doing all the school work I want for him to accomplish in week, so what does it matter if he wants to graph first or read library books first?! Plus I can choose topics he loves, which helps even more! Yes, thematic teaching can be more work than teaching from a curriculum, but it is worth it! Everyone learns better when they have the proper files and folders in their brain to categorize information. Teaching with thematic units is a natural way to learn! And if time management is a problem for you check back next Monday. I’ll post my last in this organizational series about my favorite time management tool! One of the best things about homeschooling is choosing to study what you like! We recently completed a theme unit on the history of agriculture. If this sounds like fun to you, here ya go! Pretend you are living on a family farm __ years ago. Write a letter to someone telling them about your day. Create a timeline of farm history (We started about 1800.). Add to it through the unit. These ready-made timelines were great resources! “Plant” (glue) ears of corn in numerical order. For older students, plant numbers by 2s, 5s, etc. or backwards. Use this website from nps.gov to learn how many miles a man walked to plant one acre, how much a plow cost and billions of other math facts from the 19th Century! Try this experiment to learn why rubber tires were a great improvement over horses hooves and steel wheels. Experiment with tying straw sheaves. If you don’t have straw large weeds from the side of the road will work as well. Will your sheaves protect the straw from the rain? Make a farm diorama with a shoe box, clay, plastic toy cowboys and horses (can you figure out a way to dress your cowboys to look like farmers? ), and any other things you can imagine! Try sowing seeds yourself. Grass seed is a great choice. Use a hand grinder to grind wheat. Design a piece of machinery the could help farmers. Use food boxes, paper towel tubes, brads, yarn, whatever!